Unless you have been living in a cave these past few months, you will of course already know that 2014 marks the three-hundred year anniversary of the start of the Georgian era. The fact that the time has come to give this particular chapter in British history the attention it deserves, after being overlooked for far too long, is more or less official. With a series of television documentaries, museum exhibitions and related events, this year is the year to shed light on the four Georges who ruled Britain during a period that finds itself sandwiched in-between two with which the British public are much more familiar, the Stuarts and the Victorians. The room of the old masters features The Holy Family with St Francis, by Peter Paul Rubens, from c. 1610-20 (centre picture). As was common at the time, the painting was made slightly taller by a later artist extending the painting at the top, so that the work would better fit the frame that the owner intended it to go in. For me, this was my second dose of Georgians in recent times, after the marvellous Georgians Revealed at the British Library (which opened last autumn – obviously they did not get the memo). But while The First Georgians at the Queen’s Gallery was, in one sense, a revisiting of the same era, it also served as the perfect contrast to my British Library visit last year. For a start, the Georges themselves – the kings, their families and their courts – were barely featured in Georgians Revealed, while here the royals are the primary focus. While the British Library used its extensive print media archive to focus its attention on the evolution of British society and culture in the period, the Queen’s Gallery, the home of the Royal Collection, brings together a magnificent array of paintings, sculptures, furniture, porcelain, tableware, musical instruments and even a wind-up organ that plays the music of Handel to bring the eighteenth century royal court to life. And, as its title suggests, The First Georgians visits only the first half of the Georgian period, covering the reigns of George I and George II. The cut-off point of 1760 is significant not least because this is about the point at which the Industrial Revolution is getting well underway, and bringing about the kind of social, economic and political change that formed so much of Georgians Revealed‘s narrative. But also because the third king George was the first of the Hanoverian dynasty to have been born in Britain, and speak English as his first language. The first two Georges were both born in the tiny Germany principality of Hanover, and came to Britain in 1714 as a ready-made royal family. A foreign import, brought in by the British parliament to ensure a protestant succession. The exhibition asks – and does a good job of answering – who were these German kings? What was their relationship with their new kingdom and their new subjects like? And what mark did they make on British history? 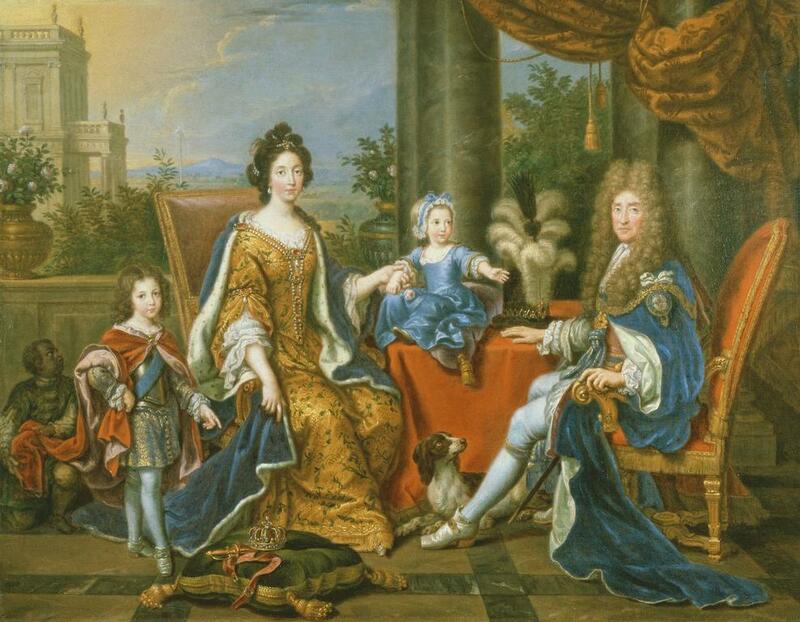 The alternative royal family: this portrait of James II, his wife and his children was painted by French artist Pierre Mignard in 1694, six years after Britain’s last Catholic king had been driven into exile in France. The elder child is James Francis Edward Stuart, referred to as King James III of Great Britain and Ireland by his supporters. It would be his son, Charles Edward Stuart or Bonnie Prince Charlie, that would lead the Jacobite rebellion of 1745. Ever since James II had been booted off the throne by parliament in the Glorious Revolution of 1688, Catholicism had been regarded as tyrannical, bound up as it was with the idea of absolute monarchy. But so long as James II’s descendants were still alive, and so long as they were supported by both British Catholics and other Catholic countries in Europe, the exiled Stuarts (or Jacobites) served as a potential focal point for any disgruntled, out-of-favour politician or member of the nobility. So the threat of a Catholic uprising or (probably French-backed) invasion was a looming threat for both the Hanoverian dynasty and the political establishment throughout the first half of the eighteenth century. The luxurious portrait of James II in all his regal finery accompanied by his family, along with the pamphlets and posters proclaiming James III (son of James II) king of Great Britain and Ireland (printed in French) are illuminating reminders of both the defiance of many people at that time, and of an alternative history of Britain that just might have played out. The very fact that George I and George II were German, and that they were so distantly related to the kings and queens of England that had come before (more than fifty closer relatives of Queen Anne, the last of the Stuarts, were excluded from the line of succession on the grounds of being Catholic), has always counted against them when it comes to their historical legacy. Naturally, the British public were hardly overjoyed at the prospect of a 54-year-old foreigner who could barely speak English coming to rule over them, and neither George I or George II did much to bolster their popularity by frequently going back to Hanover. But the job description given to the first Georgians was to be precisely the kind of well-behaved, uncontroversial, and above all constitutional monarchs – with severely limited power – that the British political system now required, and if that meant being largely forgotten in a few centuries’ time, so be it. While absolute monarchs like Louis XIV were busy building stupendously vast and opulent palaces like Versailles, George I preferred to be seen as a frugal monarch, and less distant from his people. So upon his arrival in London he established his court at St James’s Palace which, in the marvellous contemporary depiction of London on display, looks a rather old-fashioned, ramshackle collection of buildings, surrounded by the elegant neo-classical terraces that would come define Georgian London. The Tudor buildings of St James’s also served as the perfect setting for Queen Caroline, wife of George II, to immerse herself in English history. It was Caroline who read Shakespeare, and had his plays performed at court, and collected a number of paintings and busts of the Tudor and Plantagenet kings. It is the objects in the royal collection that she acquired, including paintings by the quintessential (and also German) painter of the Tudor age, Hans Holbein, that are the real surprises of the exhibition. And it is fascinating to see how this former German princess really embraced the role of British Queen and came to love all things British. Indeed it is Queen Caroline who emerges as the real star of this show. If the aim of the exhibition was to make the first Georgian kings seem more interesting, then perhaps it was trying to achieve the impossible, since neither George I or George II really were all that interesting. Neither was particularly charismatic, flamboyant, or a great art collector. But the exhibition succeeds spectacularly in bringing Queen Caroline to life, a woman who was clearly intelligent, cultured and, by all accounts, incredibly likeable. It was she who people came to see when they came to the court of George II, the king a rather grumpy and bad-tempered character who was far less fond of parties than his wife. She established a library at St James’s palace. She took a keen interest in the scientific developments of the day, popularising the revolutionary new practice of disease immunisation by having three of her children inoculated against smallpox. The British public came to regard her as the real power behind the throne, and she was greatly mourned by her people when she died in 1737, just ten years after becoming queen. Her strong personality and her popularity, among both the British public and the ruling elite, played a crucial role in enabling the Hanoverian dynasty – which would go on to rule Britain until the twentieth century – to settle in. Little wonder that Lucy Worsley, presenter of the exhibition’s accompanying television series, says Queen Caroline is her personal favourite of all Britain’s queens. The other somewhat unknown royal figure that the exhibition sheds light on is the eldest son of George II and Queen Caroline, Prince Frederick (or Friedrich, as he was born), Prince of Wales. Were it not for his sudden death nine years before his father, he would have succeeded George II as King Frederick I. Still a young boy when his grandfather became King of Great Britain, and his parents Prince and Princess of Wales, Frederick was left behind to be schooled in Hanover. He would not see his parents again until his teenage years, and this early separation from them obviously affected him deeply. He and his father’s relationship was so bad that Frederick devoted his life to doing anything possible to annoy him. During George II’s reign Prince Frederick publicly opposed any of the king and his government’s policies. The Prince of Wales established a rival court to the king and queen, and held his own parties and functions, which opposition politicians flocked to. This family rift is hugely significant in British history. Coming at a time when British parliamentary democracy was still in its infancy, it did much to establish the notion of a ruling political party and an opposition party. Meanwhile monarchs who would go on to have fraught relationships with their eldest sons include George III, Queen Victoria and George V.
There’s a section of the exhibition devoted to Hogarth, whose depictions of the hard lives of ordinary 18th century Londoners I felt was a tiny bit out-of-place, but seeing an entire wall dedicated to his legendary set of prints, A Harlot’s Progress, was a treat all the same. And there’s a whole room dedicated to the wars fought by the first Georgians, which includes lots of military maps which will delight and enthrall anyone with an interest in military history. The detail on the maps is absolutely breathtaking. George II was the last British monarch to lead his troops into battle, at Dettingen in 1743. An enthusiastic and capable military commander, George’s campaign may have pitted him against Britain’s oldest enemy, France, but it was part of a war that would almost certainly not have concerned Britain at all, had her king not been a German. Britain at this time would much rather have been spending money -and lives- on strengthening its navy, protecting its lucrative trade routes and safeguarding its overseas colonies, so George II’s fighting in the Austrian War of Succession (a pan-European dispute about whether or not a woman should be emperor of Austria) did not go down too well with the public. This despite the battle of Dettingen ending in a decisive victory. In sharp contrast, the victory by George’s son, the Duke of Cumberland (younger brother of Frederick, Prince of Wales) over the Catholic invaders led by Bonnie Prince Charlie (grandson of James II) in 1745 altered public perception of the Hanoverians dramatically. With the last Jacobite rebellion defeated, Protestantism had triumphed, and parliament’s decision to parachute in a foreign royal family rather than let the Catholic Stuarts reign appeared to have been vindicated. While it may not have the dazzling intricacy and painstaking detail of the Dettingen maps, the piece of paper containing notes and rough sketches of how the troops would line up, drawn by Cumberland and his generals the morning before the last battle ever fought on British soil, the battle of Culloden, is a truly incredible piece of history to see in the flesh. The last room of the exhibition is definitely the best. I could not help thinking that the magnificent royal portraits, which really bring the personalities of the Georges, Queen Caroline and Prince Frederick to life, might have worked a little better nearer the beginning of the exhibition. 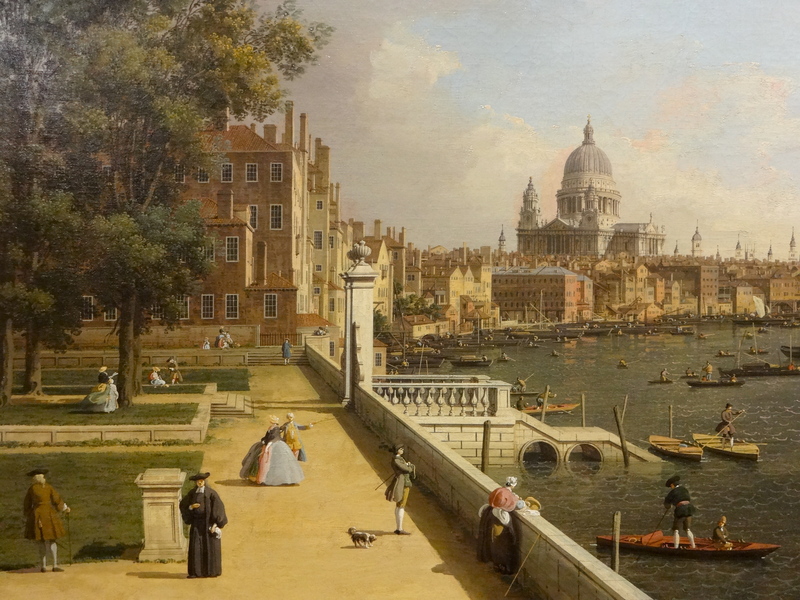 But the main reason I loved the last room was the enormous panorama of London by Canaletto (of The River Thames with St. Paul’s on Lord Mayor’s Day fame). Made up of two paintings, displayed side by side, the view is from Somerset House, facing the River Thames, with the skyline of the City of London in the left painting and skyline of Westminster in the right painting. It’s almost the same vantage point one gets when walking over Waterloo Bridge today which, as most Londoners will tell you, is possibly the best riverside view the capital has to offer. Only with Canaletto’s view you get to travel back in time 250 years! I could have stood and stared at these paintings, with their colourful cast of eighteenth-century Londoners, each individually painted in exquisite detail as they walk down the street, chat to one another or row their boats across the Thames, for many hours. Just as well my ticket allows me repeated entry into the exhibition whenever I like at no extra cost. 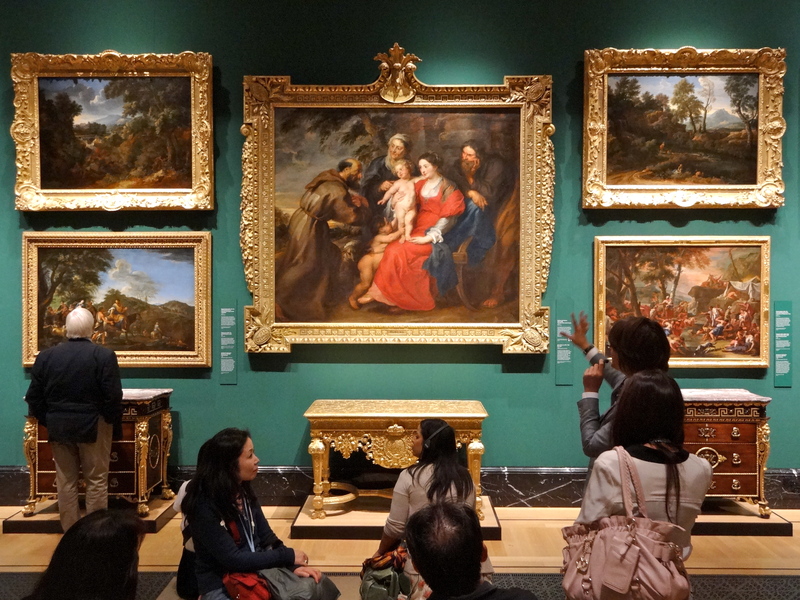 The First Georgians: Art & Monarchy 1714-1760 runs at the Queen’s Gallery, Buckingham Palace until 12 October 2014. Tickets cost £9.75 for adults and £4.95 for children. Be sure to pick up the free audio guide. Tags: 18th century, A Harlot's Progress, Bonnie Prince Charlie, Britain, British Library, British monarchy, Buckingham Palace, canaletto, catholic, Culloden, Dettingen, Duke of Cumberland, dynasty, empire, exhibition reviews london, exhibitions london, First Georgians exhibition, France, George Frederic Handel, George I, George II, George III, George IV, Georgian, Georgians, Georgians revealed, German, Germany, Glorious Revolution, Hanover, Hans Holbein, Jacobites, James II, James III, king, London, Lucy Worsley, painting, parliament, portrait, Prince Frederick, Prince of Wales, protestant, queen, Queen Anne, Queen Caroline, Queen's Gallery, Queen's Gallery Buckingham Palace, Royal Collection, science, Shakespeare, Somerset House, St James's Palace, Stuart, Stuarts, The First Georgians, The First Georgians review, Tudor, Victorians, war, War of Austrian Succession, William Hogarth. Bookmark the permalink.